Sprawling 5 acre estate located just minutes from the beach and Point No Point Lighthouse. Green Gable Inn offers a choice of the main house which boasts 3 bedrooms and 2.5 baths, a large great room with 20 ft. ceilings and stone fireplace. Gourmet 20X25 kitchen with granite counter tops, stainless steel appliances, kitchen table that seats 6 with views of the back English gardens. Additional dining room seats 8 overlooking the front gardens. Beautiful cherry hardwood floors on the main level. Master bedroom on main level, featuring King bed and master bath with jetted tub, separate shower and double sinks. Main level den has a full size bed. Upstairs provides 2 bedrooms (2 queen beds) with a Jack and Jill bathroom. Or combine with the private guest quarters which boasts 3 beautifully furnished bedrooms (1 King, 1 Queen and 1 twin bunk bed) and separate living room with Brazilian hardwood floors. Dining area that seats 6 with bay window that overlooks the front gardens. You may choose to combine the main house with the guest quarters (for an additional $175 per night) for a total of 6 bedrooms which will sleep up to 14 people. Contact the owners to reserve the guest quarters at (360) 638-1228. Use of amazing grounds, vast covered porch, access to the Greenway trails right next door, nature conservatory and nearby Buck Lake park. On the 2010 Hansville Garden Tour. 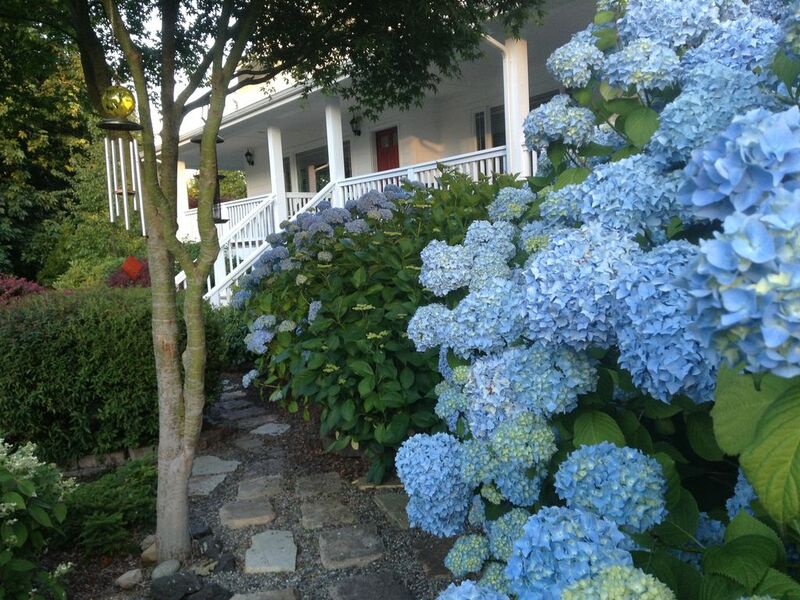 Main house rents for $375.00 per night 3 night minimum or combine with guest side for an additional $175.00 per night. Rent separate or combine the whole house for a magical stay at Green Gable Inn. Hansville is close to Seattle/Bainbridge Island and Edmonds/Kingston ferries and just a short drive to the historic towns of Port Gamble and Poulsbo that offer restaurants and entertainment. The location is also ideal for visiting nearby Port Townsend and the Olympic mountains. The front porch is great for lounging and cooking on the barbecue grill provided for your use. There is a TV and DVD in the living room along with an extensive DVD library. Guest quarter's dining table seats 6 with beautiful views of garden. You can also enjoy biking along the Hansville loop and golfing at the Whitehorse Golf Club in Kingston. In Poulsbo you can rent boats, sailboats or kayaks. Check in is 4PM or after and check out is by 10AM. Owner resides on site in detached carriage house. Keywords: Beautiful private guest quarters on 5 acre estate with lush gardens and minutes to the beach, Pt. No Pt. lighthouse and Greenway trails and nature conservatory. Provided in both Main House and in Guest House along with laundry soap. Provided in both the Main House and in the Guest House. Two wood burning fireplaces, one in the Main House and one in the Guest House. Stocked with continental breakfast items. Stocked with expanded Continental breakfast items including eggs, coffee, tea, creamer and a variety of cereals. Everything you need is included. Main House dining tables seat 14. Guest House dining table seats six and overlooks the beautiful garden. Large assortment of Legos for the Kids! Over 150 DVDs in the DVD library. Boat rentals are available in Poulsbo. White Horse Golf Club is within an easy drive. My group had an amazing time at Green Gable Inn. From booking to us departing, Ken and Brenda were so great at working with me. The house was beyond amazing! Beautiful, comfortable, so spacious. Thank you for the stay!! We are very happy our Green Gable Inn worked out for you conference. We enjoyed having you and your team and hope to see you in the future. Green Gable Inn is like home to us! This is our fifth time staying at Green Gable Inn. It feels like home to us! We always enjoy it and Ken and Brenda are super at making us feel welcome. Of course we will return! It was great seeing you two and your family again, this time for your granddaughter's wedding. We were glad to share our vacation rental and we look forward to seeing you next year. We had a wonderful family reunion at Green Gable Inn. The house is beautiful - very well decorated, furnished, and very spacious! We had more than enough room for the 10 of us (6 adult-sized people and 4 kids) to spend time together but still have room to have quiet time as well. We rented the entire house with the guest house and that meant we had two full, well laid out kitchens, which came in handy for several of the big meals we prepared. Ken and Brenda, the home owners, were very responsive to all our questions and they were happy to give us suggestions as to where to go for activities and shopping. They even went above and beyond and purchased an inflatable twin mattress so that two of our children could share a room without having to share a bed. The gardens are truly gorgeous! Other reviewers are right when they say that the online pictures do not do them justice. In addition to the garden in the front of the house there is also a beautiful forest garden behind the house that provided the children with plenty of space to run, play, and explore. It was quite hard to convince them to come back into the house even when it got nearly too dark to see. This was our first visit to Hansville and the Kitsap peninsula and we really enjoyed exploring.The fishermen among us loved fishing for salmon at Point No Point while the fruit lovers among us enjoyed picking buckets of blackberries for cobbler and crisp. Ken had a few rods that he allowed us to borrow for fishing. Foulweather Bluff Nature Preserve provided the kids with hours of fun investigating all the animals that make the tidal flats their home. Kayaking at Poulsbo was also a high point as we were able to have some friendly encounters with harbor seals. One day we drove to the Olympic Peninsula for tide pooling, which was a fun new experience for those of us from the East Coast. We spent a day in Seattle as well, though honestly after the ferry and traffic of the city we all decided that it was far better just to stay on the peninsula. Oh, if you're a person who likes to go out for morning jogs or walks, there are also forested trails that act as shortcuts to the beach and Buck Lake which are fun to try out as well. I would definitely recommend Green Gable Inn to large family and friend groups. We would love to stay there again if we ever return to Hansville! Trails and beaches..and the kids loved the secret gardens. Hope to see you next time you visit Hansville. Our group of 8 (2 adults, 6 teens) had two objectives in our 12-day trip to coastal Washington, to a) relax and b) explore and see the sights. The Green Gable Inn met our needs perfectly! The house is presented accurately on VRBO, although the pictures can't begin to capture the actual quality of the inside or of the grounds, which were both amazing. Arriving late the first day, we were pleasantly surprised to find the kitchen pre-stocked with coffee, a dozen eggs, fresh bread from a local bakery, and all the necessary basics for cooking. The house was spotless and the beds excellent. We used both the main house and the guest house, which have both interior and exterior (porch) access so they become simply one large living area. The house is not directly on the water but we enjoyed the daily walks down to the beach. The 5-acre property is quite beautiful, with private drive, tall trees, and a large grassy field, all complemented by some amazing landscaping. We especially enjoyed our evening debriefings of each day's activities on the long wrap-around porch with swings, rockers, etc. The house is centrally located for daily excursions in all directions, both on land and via nearby ferries. We enjoyed exploring the Olympic Peninsula, Whidby Island and Deception Pass, white water rafting up towards Mt. Baker, all the quaint little towns in the area, and of course Seattle itself. Our thanks to hosts Ken and Brenda for making our stay at Green Gables Inn a huge success! Bob we are glad you and your grandkids had a great vacation in the Pacific NW and our house was able to accommodate your family. Thanks for the lovely review and we hope to see you in the future. We also want to explore the white water rafting neat Mt. Baker. Ken and Brenda. We are glad we could accommodate your family reunion and enjoy our location, our beautiful beaches and we were able to help with the flat tire. We were having a small family reunion, with 5 adults staying in the house for 4 nights and a few other family members stopping by to visit. The house and gardens are beautiful and for our group there was more than enough space for everyone to have their own bedroom, bathroom and places to relax quietly in the garden on the porch or in the house. The kitchen and dining areas provided great spaces for enjoying meals and time together. The kiitchen is huge and well-appointed, which made cooking together a lot of fun for us.